Reynolds leads Navy past Temple. With a 300-pound lineman rumbling toward the end zone for a game-tying touchdown, Navy’s defense came up with its biggest stop. 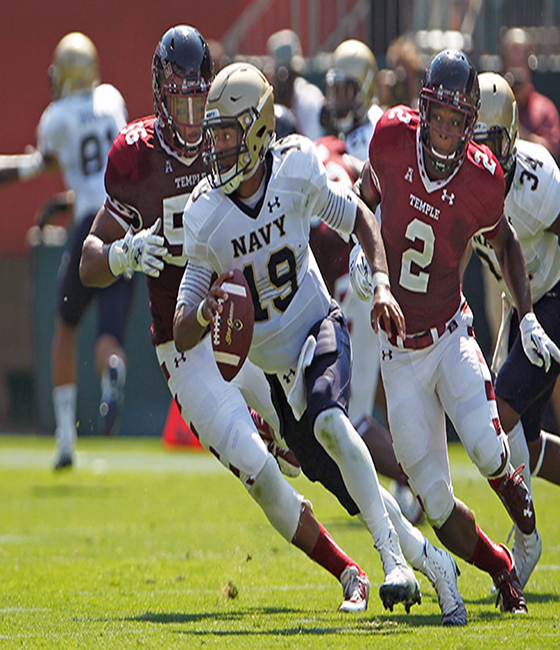 Keenan Reynolds ran for 173 yards and two touchdowns and Chris Johnson recovered Brendan McGowan’s lateral at the 10 to help the Midshipmen hold on for a 31-24 victory over Temple on Saturday. ‘We put our defense in bad spots with turnovers, but they battled all game,” Navy coach Ken Niumatalolo said. Reynolds only completed 4 of 8 passes for 30 yards while leading a triple-option rushing attack with 487 yards rushing and helping Navy (1-1) rebound from a tough loss in its season opener. The Midshipmen had a 14-13 lead over then-No. 5 Ohio State in the third quarter before losing 34-17 last Saturday. P.J. Walker had 240 yards passing and two TDs for Temple (1-1). The Owls were coming off an impressive 37-7 upset over Vanderbilt last week. The Midshipmen needed a defensive stand to preserve the win after Nick Sloan missed a 43-yard field goal that would’ve given them a 10-point lead. Walker scrambled to the 10 on the final play before lateraling the ball as he was surrounded by tacklers. McGowan, a 300-pound right guard, caught Walker’s desperate pitch and ran to the 9 before tossing it backward. Johnson snatched it out of the air to secure the win. Owls coach Matt Rhule wasn’t pleased with Walker’s decision to run from the 24 at the end. Reynolds had TD runs of 48 and 3 yards to set a school record with TDs in 10 straight games. He left the game with a right knee injury late in the fourth quarter, but expects to play next week against Texas State. ”The trainers said I’ll be fine,” Reynolds said. Temple forced seven turnovers against Vanderbilt in its first win over a Southeastern Conference team since beating Florida in 1938. The Owls picked up where they left off on Navy’s first play from scrimmage. Sharif Finch swatted the ball away from Reynolds on a pitch. The ball rolled into the end zone and Finch fell on it for a 7-0 lead. ”We got too excited and maybe ahead of ourselves,” Temple safety Nate Smith said. But Navy scored 31 of the next 38 points, building a comfortable lead that was too much for the Owls to overcome. Reynolds made a nifty move after bursting through the line and sprinted down the middle for the 48-yard score to give Navy a 10-7 lead in the first quarter. Reynolds ran 56 yards down the left sideline before getting tripped up at the Temple 20 to set up Geoffrey Whiteside’s 7-yard TD run that made it 17-7. Temple fought back late in the first half. Walker tossed a 6-yard TD pass to Romond Deloatch to cut it to 17-14 with 3 seconds left in the second quarter. Deloatch made a leaping catch in the back of the end zone. It was initially ruled incomplete, but a video review showed that Deloatch got one foot inbounds. Any momentum the Owls had following that score was squashed when the Midshipmen took the second-half kickoff, drove 75 yards and held the ball for 6:46. Reynolds capped the 14-play drive with a 3-yard TD run. DeBrandon Sanders scored on a 24-yard run on Navy’s next possession to make it 31-14. But the Owls wouldn’t go away. Walker threw a 13-yard TD pass to Jalen Fitzpatrick to get Temple within 31-24 in the fourth quarter. ”They were a better team than us and executed better,” Rhule said.